The majority of today was spent on the bus coming home but I was very excited to finally get settled into my flat in Parnell Student Village (PSV). Marjie and I are the only ones living in PSV and the other 10 people in the group are living in Uni Lodge. Parnell is further from the school, a little less than a 2 mile walk through the Domain. The Domain is a beautiful park, right in my backyard, which houses a Māori Museum, luscious trees and greenery, and various walking and running paths. I spent the afternoon setting up my room, room 3 in flat 12, and started to feel very comfortable in this new environment. I have a spectacular balcony off of my room and it overlooks the volleyball net and BBQ area in PSV so I was pleasantly surprised. I was able to enjoy fresh air all day and I did not close my door once. My flat also has a full sized kitchen, dining area, living room with a large TV, a spacious bathroom and a floor above and below me with two rooms on each. I have yet to meet my flat mates but I will keep you posted! At 7pm we had a PSV Potluck BBQ. Here I was able to meet a lot of my neighbors and they are all very friendly. PSV is very diverse and there are a lot of Americans but there is also a diverse population of exchange students and more than a handful of kiwis. Approximately 100 students live in Parnell Student Village and we have three wonderful RA’s: Josh, Kimberly and Rob. To the potluck, Marjie and I brought a large basket of different fruits but there was also potato salads, cookies, brownies, lasagna and BBQ foods. I did not eat much because I was trying to meet as many people as possible. Marjie introduced me to the friends she had made earlier in the week and I am excited to get to know everyone better. There are a lot of students on various study abroad programs, so it is very interesting hearing about the different Orientation trips each program took. 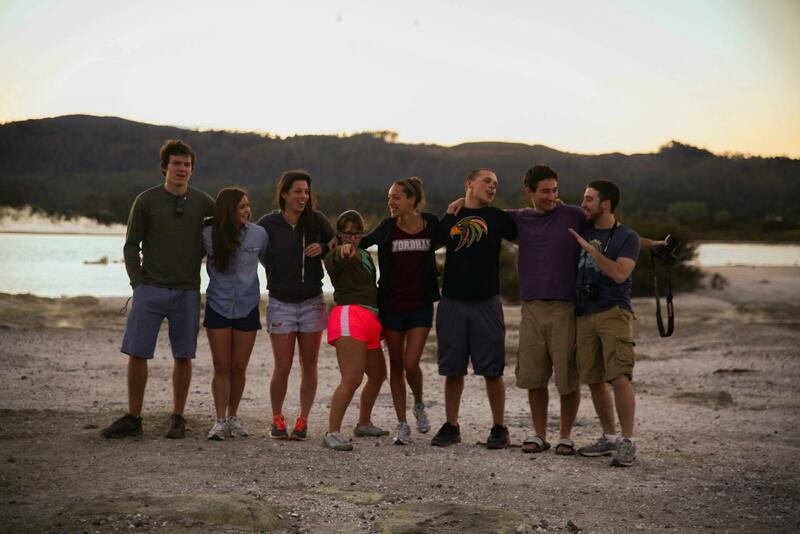 One program went to Fiji for 10 days; I was pretty jealous. After dinner all of PSV headed downtown to the Auckland Lantern Festival. It was unbelievable seeing all of the lanterns lit up and the park roaring with people. There were vendors selling food, balloons, ice cream and small knickknacks. We first headed over to the part of the park that had karaoke, this was very interesting and I am not sure how people work up the courage to sing in front of thousands of people. I give them credit because I know I could never do it. The line for karaoke was about 3 hours long and after watching a couple of acts we moved on. We then went to watch a dance act in a different part of the park. The dance was beautiful and perfectly synchronized. It was just about nearing the time for fireworks and I knew I wanted a little treat before the fireworks started. We went back to the main road with the rows of vendors and I perused for a while before I decided on Thai food. I was debating between a large watermelon with ice cream on it or some noodles. I got a large container with Pad Thai and fried rice for $5- what a steal. It was delectable, and as full as I was, I could not put it down. We then found ourselves a seat on the grass and looked up towards the Sky Tower for the Fireworks. The fireworks show was nothing like one in New York and was very anticlimactic. It was about 5 minutes in total and there was no grand-finale but it was beautiful watching the fireworks go off above the needle on the Sky Tower. After the fireworks I was exhausted and it was time to call it a night. This morning we woke up at 6:30am to go on a walk to see the sun rise. We walked along the sulfur lake in the opposite direction as the day before. It was beautiful watching the strong and proud sun shine through the mountain tops, excited for the day ahead. After breakfast we went to Waitapu Geothermal Wonderland and Lady Knox geyser. New Zealand is above a plate boundary at a subduction zone, which is why there are so many volcanoes, craters and volatile activity. At the Geothermal Wonderland we looked at a huge mud pool caused when “acid waters attack and dissolve adjoining ground to digest many minerals in the rock.” The acid sulfite (or mud pools) is 60°-80° C and I could feel the heat through the rising steam. At 10:15am we watched the Lady Knox Geyser erupt. This is an active geyser, but natural eruptions are unpredictable, so at 10:15am every day the park pours salt into the geyser to force an eruption. I thought the eruption was huge, but we were informed that there has been very little rainfall recently and usually the eruption is much bigger and sometimes lasts for a half-hour. After the eruption we took a tour through Geothermal Wonderland with Martin. We were able to see all of the different hot springs and craters and learn about the sulfur lakes. Many of the craters formed because they were volcanoes that fell inward creating a large depression in the land. Each one is unique and the land and substances in these craters are very volatile. The park was also filled with these very odd trees that were hook shaped. Each tree leaned in a different direction and it was fascinating to see. After the park we headed back to Rotorua and had a lunch break. I took the two hour break to myself and ran around town looking for an inexpensive clothing store because I was starting to get sick of my bright pink shorts. I purchased a LBD (little black dress) and was now starting to get excited for the night ahead that I would have something semi-cute to wear. Lunch was over and we were off to Zorbing! Zorbing is just about one of the coolest things ever and I remember doing my research on New Zealand and writing about this in my application essay. A zorb is a large plastic ball with another smaller ball inside and shock springs connecting the two to help create a smooth ride. The ball on the inside is filled with about a foot of water and then three people are thrown inside. To get inside, one must run from about 3 feet away and then jump through the hole. Naturally, I got stuck midway and was forced to wiggle my way through the rest. The zorbs were on the top of a hill looking over all of Rotorua and the lake, it was a beautiful view. I was in a zorb with Meghan and Caroline; once we got our bearings together we stood up and were ready to race! We were racing the Wellington kids: Jocelyn, Ethan and Alex, and we knew we were going to win. After the countdown we started running and then fell to our knees and sloshed in the water all the way down the hill. Sadly, the video we took is mostly of Caroline’s legs, but it was so much fun we won’t be able to forget it! For the last group of three that went, the rest of the Arcadia crew got to line up on the grass to let the zorb roll over us. I was towards the end of the line and the zorb ended up rolling over my head; it was not the best feeling. For dinner we were going to a Tamaki Māori Village experience. This has been one of my favorite events so far because we really got to learn and appreciate the Māori culture. The culture and customs are so beautiful that I have become intrigued by their songs and dances and I hope to learn and see more throughout my stay in New Zealand. A hongi is a traditional Māori greeting in New Zealand. It is done by pressing one’s nose and forehead (at the same time) to another person at an encounter. During our stay we were able to see the Haka performed. The Haka is “traditional ancestral war cry, dance or challenge from the Māori people of New Zealand. It is a posture dance performed by a group, with vigorous movements and stamping of the feet with rhythmically shouted accompaniment.” The New Zealand rugby team, The All Blacks, perform the Haka before their matches which shows how important the Māori culture is in all aspects of life and has made the dance more widely known around the world. 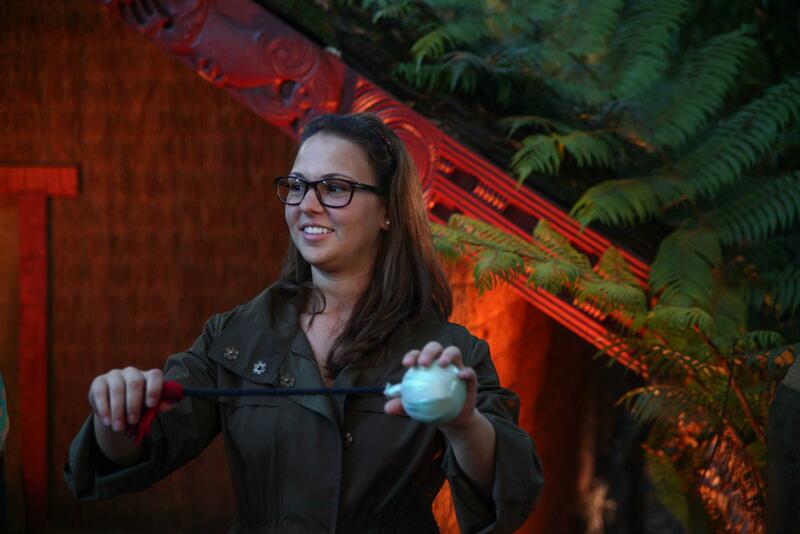 We also were able to hear about and play different games that the Māori play. Every game is a lesson and teaches a valuable trait such as hand-eye coordination, agility, speed and flexibility. These games were intended to be fun but also helped give the skills needed so young men could be prepared for war. After we played games, heard singing and dancing, our food from the Earth was ready. Our attendance in the village called for a celebration; therefore, the tribe prepared a hangi. A hangi is a hole dug in soft ground, next a fire is lit and when the fire goes out the rocks are put in the hole and are used as coals to cook the food. First red meats are put over the rocks and are wrapped in flax of cabbage leaves, on top of the cage of red meat is another cage of white meat wrapped in the same manner, after comes the shellfish and then the vegetables are placed on top because they cook the fastest. The entire whole is covered in a large wet rag, which looked like a large burlap tarp, and once a tight seal is created, soil is thrown over the rags. The hangi is left for three to five hours, and in this time all of the food will cook to completion. Then we got to enjoy the feast! I tried some of everything and it was all delicious! There was chicken, fish, muscles, salad, vegetables and most interestingly kumara. Kumara is similar to a sweet potato but does not have the same orange coloring. For dessert, I was able to try Pavlova for the first time. Pavlova is a meringue-based dessert with a crisp crust and a soft, light inside. In April we will be going to Kate’s house to learn the recipe and how to make Pavlova. The entire night was very enjoyable and I hope there is a similar experience near Auckland that I will be able to take Gianna and mom too when they visit. On the ride home from the village we entertained ourselves by singing karaoke. Jane’s favorite was Build me up Buttercup by The Foundations. But we also sang along too Call Me Maybe, a variety of Spice Girls, Backstreet Boys and Smash Mouth songs. It was a lot of fun and everyone on the bus was singing. We got home just in time for the Pub Crawl that was organized through our Backpackers and we were off too Hennessey’s and Pig and Whistle to enjoy live music performances. We ended the night in Heaven and Hell, a night club that everyone in the town must have been in. For a very small town, this location was packed and once our feet started hurting from all of the dancing we called it a night. I also tried my first meat pie! It was very, very good, similar to a chicken pot pie. We went to The Bakehouse Cafe, along the Main Street in town, and I had a beef, bacon and cheese meat pie. I understand all of the hype but I would not be able to eat these on a daily basis. Pierce was thoroughly satisfied with his chicken and beef meat pies, and for hours he talked about how perfect it was to finish off the chicken one with a beef pie. After lunch we walked around the town and came across a very small fresh fruit market. The prices were absolutely outrageous, so I did not get anything but Ryan shared a kiwi berry with me and it was exquisite. Kiwi berries are mini kiwis that are the size of grapes and I recommend everyone tries one. Then we were on our way to a farm show at Agrodome. When I first walked in I thought the sheep greeting us was fake, she was chewing in the most synchronized motion I had to do a double take before I realized she was real. There were about 18 sheep lined up around the room and each one was beautifully unique. I took the time to introduce myself and play with each one. Interesting fact: There are 3 million humans in New Zealand and 40 million sheep- wow. I took a seat in the front row and I was on the side that the show host sheered (shaved for wool) a sheep. This sheep gets shaved every six months and it was fascinating to watch this man maneuver the sheep in between his legs shaving every inch in under 3 minutes. The show also required participation from the audience to milk a cow. Other animal tricks were shown off by dogs, ducks and little lambs. They were the cutest animals I have ever seen. After the show we were able to play with the lambs and feed them. I held a black and white spotted lamb in my arms as I fed her a bottle of milk, I wish I never had to put her down and needed to be dragged away when the bus was leaving. Our next stop was Rainbow Springs, a New Zealand animal conservation. We learned about New Zealand’s national bird, the Kiwi, and were able to see them up close in the Nocturnal exhibit. We were also able to see the tuatara, which is called a “living fossil” because it is older than dinosaurs and has been able to survive for so long because it can change its metabolism according to weather and location. The tuatara only needs to eat once every six months and can bring its heart rate down as low as six beats per minute. We also saw Jenny the kea. The kea is the smartest parrot and is able to take apart a car with its beak. When Jenny was born she imprinted on a human and thinks that she is a woman; she is very attracted to men and sees other women as a threat and will become very feisty when women try to talk to her or come near her home. We saw a variety of lizards, fish and birds. Past the trout and swan pond, we looked at a 60 year old California Redwood Tree; it was introduced to this park and grows twice as fast in New Zealand because of the nutrient rich soil it is planted in. We also were able to get a close look at the Silver Fern which is New Zealand’s National Symbol. After the park we checked into our Backpacker, Crash Palace and a group of us headed out in search for a restaurant for dinner. We finally settled on the restaurant Fat Dog, and we were all pleasantly surprised. At Fat Dog I got a chicken Panini with onions and mango peach infused cream cheese; it was unusual and very good. Once we were all full we decided to explore and we attempted to walk around Lake Rotorua. Little did we know that it was a 10+ mile trail, and we did not make it a quarter of the way before we had to turn around. When we got back from our walk we went back to Crash Palace to change into our togs and then headed to the Polynesian Baths. Because I did not bring my bathing suit and my clothes were also serving as my pajamas, I opted out of going for a swim in the sulfur pools. Instead I sat with my legs in the water chatting with Dan for hours. Each bath was a different temperature and they all looked out onto Lake Rotorua. It would have been very peaceful, but the baths were filled with people and there was a lot of noise. In Rotorua there was a large Haka Dance Competition going on this evening and after the competition was over all of the Māori people came to the baths. It was great getting to converse with more Māori’s and hearing about the competition. After the Baths we headed back to Crash for a quick shower and then headed out to Pig and Whistle to celebrate Ryan’s 21st birthday. Today we landed around 7am- earlier than expected. Getting through customs and passport control was a breeze and we were off in no time. Our Orientation Weekend is until Sunday through Arcadia with both Auckland and Wellington students. Our first stop was Kiwi International Hotel. It was about a 40 minute drive to the hotel because we were traveling during rush hour and when we got there we were not able to check in. We all put our belongings in a room, changed and were ready to explore the city. We first went to an Otago University Building and were given information about the city and Orientation by Jane and Kate (our wonderful Arcadia staff who have been helping us for the last couple of months and will be leading all of our Arcadia adventures this semester). After the information session we walked to the Uni to visit the International Student Office to get our ID Cards. I had no idea when I submitted my Sigma Kappa composite picture that it was going to be used for my Student ID card. We were given a brief tour of the campus and then continued on through the city. We first walked through Albert Park, a small, beautiful park near the campus. The park was in the beginning stages of being set up for the lantern festival going on this Saturday and Sunday. Sadly, we will not be in Auckland this weekend to see the festival going on but the lanterns and decorations looks beautiful. There are colorful birds and butterfly lanterns hanging from the trees, large goldfish and sheep in schools and herds around the parks grass and dragons in the fountains. From the park we walked to Queen Street. I was shocked by how modern the architecture and city was. As I looked up I saw high rise buildings for PwC, Ernest and Young, Delloit and many more. This made me very excited because I felt a spark of hope that I will one day have the opportunity to work here. Then the time came where we were at a main intersection and obviously, it was time to cross. A loud ring sounded and traffic from every direction stopped, cueing pedestrians to make their move. At this moment people coming from every direction were crossing through the intersection at different angles. A square intersection filled with the hustle and bustle of people and 45 seconds later the intersection cleared and cards continues on their way. We then left Kate underneath a mall in the city close to the Ferry Station and were on our own to convert money, shop and get lunch. While everyone was exchanging their USD for NZD I ventured upstairs to The Warehouse, the Walmart of NZ, with Marjie and Lyssa. First things first, I knew I needed a straightener to tame my young and wild bangs, and I also wanted to purchase a cell phone because I knew my parents would appreciate hearing that I arrived safely. A straightener, some sun screen and a stylin’ flip phone later I was ready to eat! Downstairs I enjoyed a wrap from a Smoothie and Sandwich shop. I ordered a Chicken wrap that had mixed greens, cranberry, feta cheese and grilled chicken. It was very tasty. Unlike wraps in America, it was light and airy but very filling; I will definitely go back. We ate on very spacious wooden lounge chairs down by the Ferry station overlooking the water. After lunch we went to the 2degrees store to purchase prepaid cell phone plans and then it hit 1:30pm, perfect timing to meet back up with the group. When the group was back together we got back on the bus and headed for Cheltenhan Beach, a short ride over the bridge. Before lounging on the beach, we hiked North Head which is a high point on the North Shore peninsula overlooking Waitemata Harbor. In the distance, we were able to see Rangitoto which is the most recent inactive volcano which last erupted 500-600 years ago. The views were absolutely breathtaking. We were able to see the Sky Tower, Auckland Harbor Bridge and beautiful sites of harbors filled with yachts of all sizes. Ryan, Pierce and myself purposely got left behind to have more time to take in the remarkable view and enjoy the silence. When we all took the pictures, from every angle, that we wanted, we decided to head back down on a new route. Little did we know we would be sliding down most of the mountain rather than walking; it was adventurous to say the least. When we finally reached the bottom we were hot, sweaty and ready for a swim. Everyone else already had their togs (bathing suites) on and were racing towards the water. We all swam out to a wooden float about 20 feet out. The water was quite chilly if you ask me, but everyone else thought I was crazy. We relaxed on and jumped off the wooden plank and then did it all again. After an hour we were summoned out of the water and it was time to return back to the heart of the city. We arrived at our hotel with 30 minutes to get ready for dinner. I was the last up to my room, after waiting for the very slow elevator for 15 minutes, and my roommate for the night greeted me at the elevator door in panic to notify me that we did not have a shower in our room and needed to use the communal shower. After being awake for almost three days without a shower, this was not how I imagined my first one in New Zealand. Saddened and in a rush, I dropped all of my luggage in our room 253, grabbed a bar of soap and a towel and ran off. There was no happy middle of water temperature so I spent the fully 3 minutes I was in there screaming out of pain from scolding hot water or freezing cold. Bangs straightened, mascara on and bag packed, I was out the door for dinner. Dinner was with the entire group at La Porchetta, a decent “Italian” (really just pizza) place. After dinner the group was split between who wanted to get ice cream, go out or just go to bed. Our compromise was Gelato first, and then we would go to Father Ted’s a local pub to check it out. We went for Gelato at Valentino underneath the Ferry Building. I did not have any, but it all looked very good and looking out on the water at sundown was very peaceful and relaxing. Father Ted’s was a fun place, we sat outside for a short while, met an Irish man who told us about his crazy stories. He kept us entertained for a while and then we decided that it would be best to get a good night sleep. Well today marks the start of my journey. I am currently sitting in the airport and am saddened that I am so technologically illiterate that I cannot figure out how to get wifi to work. My pre departure pampering has gone to waste as all of my nails are chipped, for the third time in two days, my hair is no longer perfectly straightened and the scent of DKNY Apple perfume, that I soaked myself in, has left a train in the air throughout the airport. I thought it was going to be sad not being seen off by anyone at JFK Airport but it allowed me to save some tears and get focused for the 24 hours of travel time I have ahead of me. The last month has been a very big fustration trying to figure out how I am going to carry six months on my back. I could not have done it without the help from my bother but with a 50.5lb checked luggage, a 35lb carry on and a stuffed backpack later, I feel very prepared. If there is one thing I dislike more than any other, it is the feeling of panic that comes over me when I feel I have forgotten/lost something. I have experienced this feeling over a dozen times today, and I am sure I will constantly throughout the course of the day. I am frequently checking to make sure my [passport and ticket are in my front pocket, my phone, iPad and laptop are in the back pocket and my folder full of travel documents in the middle, it is very tiring. In 30 minutes I will be boarding for the first leg of the trip to LAX. I will then have a two hour layover before my next 14 hour flight taking me straight to Auckland. When I arrive in Auckland, I will be traveling on the group flight, it will be 7:15am on February 21 and I need to be refreshed to conquer the first day of Orientation. The Peer Mentor inside of me has me so excited that for the next 10 days I will be in Orientation for Arcadia and then the University of Auckland/Parnell Student Village (my housing). I am more than ready to “embrace the cheese” and I only hope my classmates are willing to do the same. Everyone keeps asking me what my feelings are right now, am I nervous? Scared? Excited? And all I keep thinking is that I am ready. Am I scared, no not yet. Nervous, I guess I am a little nervous, and confused, as to why I am taking a finance class this semester. Excited, no I am not too excited for what is going to feel like a never-ending day of traveling, but I am sure in 20 hours my excitement will be on overload. Ready- am I ready? I guess as ready as I will ever be. I do not know anyone, I am not sure who my flat mates are. But it is thrilling and exciting that most things about this far away land are unknowns. I wanted this semester to be adventurous, life changing and fun- and I am ready for my mind to be blown.